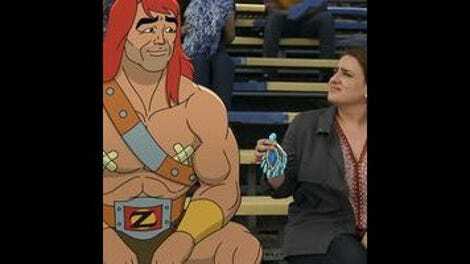 When we last left Son Of Zorn, Craig had run off. He witnessed Zorn, Alan, and Edie having an emotional, sensitive, heart-to-heart moment, and he felt that his place in the family was no longer necessary. I don’t necessarily agree with Kalya Kumari Upadhyaya’s assessment that everyone on the show outside of Zorn exists as merely devices (by the way, thanks so much for covering for me! ), but I do agree that this was an unnecessary narrative turn. Craig’s weirdo perspective and off-kilter character has been a surprising fit in the overall dynamic. 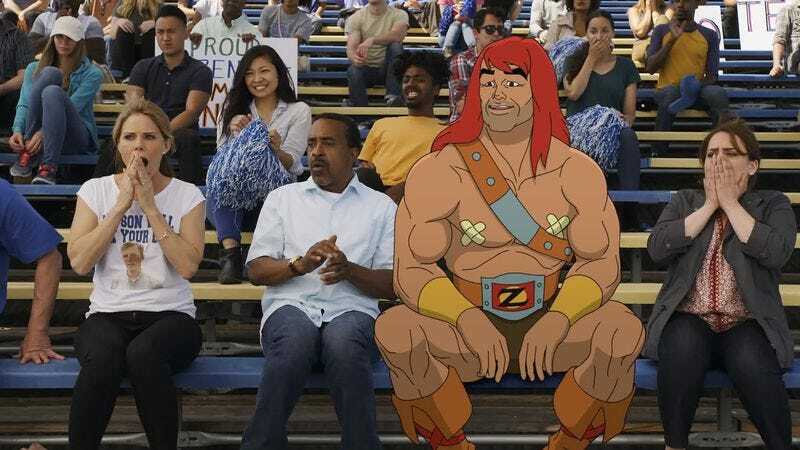 He may be Alan’s eventual stepfather but he fits the role of the kooky uncle, and Son Of Zorn puts a lot of milage in the show’s family unit. Having him run off exhibits the rhythms of an emotional story beat, but it doesn’t quite fit Craig’s character–certainly not the character we’ve been introduced to thus far. This is the show’s first real attempt at a story arc though; maybe there’s something else going on with Craig? Some layer we haven’t quite peeled yet? “The Quest For Craig” is the undercooked follow-up to “The Battle Of Self-Acceptance,” an episode that just feels like a batch of weird character gags than something with a concrete plot. Any tension that might have been present when we learn that Craig has been missing for two days dissipate when we see him living (I think) with his brother. Isiah Whitlock Jr. is always awesome to see, and he definitely makes an impression as Robert, a go-nowhere con man who always scams Craig to fund his awful ideas. It’s sort of nice to get a idea at what Craig’s family life is like, although it would have been great to have more of this. We never get a hint of something more, something that might have defined Craig’s past, and that speech by Tymberlee Hill’s Diane is too anecdotal to make an impact (show, don’t tell, etc.). Craig developing the courage to fight for Edie would probably have had more meaning behind it if the renewed Zorn/Edie interest in each other made sense. I’m not exactly sure what writers Mark Stegemann and Matt Roller were going for here, tone wise. I mean, I get that by having Edie and Zorn reminisce rather passionately about all the fun they had when they were together, we’re supposed to assume they may be potentially getting back together. But it feels forced; Cheryl Hines in particular never seems to get a handle on how much her character did enjoy her time with Zorn–she more or less just parrots everything Zorn brings up. Edie works better when she utilizes her Zephyrian past on her own terms. Also, were we supposed to know Zorn and Linda were dating? We caught them sleeping together at the end of the last episode, but it wasn’t really clear that they were an item until the end. I thought Linda’s growing annoyance was over how inane Zorn’s and Edie’s conversations were, not something that bordered on jealousy. Really, all the relationship beats were rather muddled, which made the roadtrip, and the subsequent forgivenesses, rather hollow. Surprisingly, the Alan B-plot was stronger, but not by much–mainly because it was all rather straight-forward. Layla convinces to show-off his Zephyrian legs to the school, and everyone loves them. They especially love his ability to kick pretty much everything into the sky, making some pretty funny visuals, like kicking a dumpster onto the top of the coach’s car. Of course, this leads to him being recruited as the kicker for the football team, and as he makes “friends” with the jocks, he ends up alienating Layla, possibly for good. Again, the relationship aspect falls flat. Layla’s not wrong to grow concern over Alan’s increasing acceptance of jocks’ behavior (he’s totally down with joining the team to shove nerds into lockers), and how he forgets to hang out with her after school, but we never see him commit those acts, so it all comes off… theoretical. (It also doesn’t help that Layla was barely a character). But it does lead to a funny scene of Alan kicking a football so hard into a kid that it breaks every bone in his body. It’s those weird outside gags and bizarre character moments that makes this episode somewhat enjoyable. Robert, the coach, the weird creepy dude who had Craig’s sweater–they’re the ones who added spark to this episode, and to the overall world that would tolerate a guy like Zorn and a place like Zephyeria. Beyond that, “The Quest For Craig,” was futile. With all those weird side characters, that they sidelined Linda and her delightful eccentricities much of the episode feels like a law’s been broken. I did like all the weird tricks Zorn used to try and find Craig. The sniffing was silly, but the hawk thing was so absurd that I had to laugh. I also liked the jewel trick to get away from that police officer. I really wish they committed more to those bit. Somewhere, there’s an episode where Zorn and Edie use a bunch of ridiculous Zephyrian nonsense to get out of low-stake scraps. This was not that episode.